The majority of the projects I design provide some sort of informational feedback to the user. The primary device I use to provide feedback is a Liquid Crystal Display (LCD) based on the Hitachi HD44780 LCD command set. These LCDs use a standard 16 contact interface and are known as parallel devices. The LCD can be operated in two modes: 8-bit and 4-bit, respectively. A minimum of 11 microcontoller pins are needed for 8-bit mode and 7 are needed for 4-bit mode. Dedicating 11 or 7 pins for the LCD might pose some unwanted limits on one’s design thus, we will create a serial LCD controller that only needs one output pin. 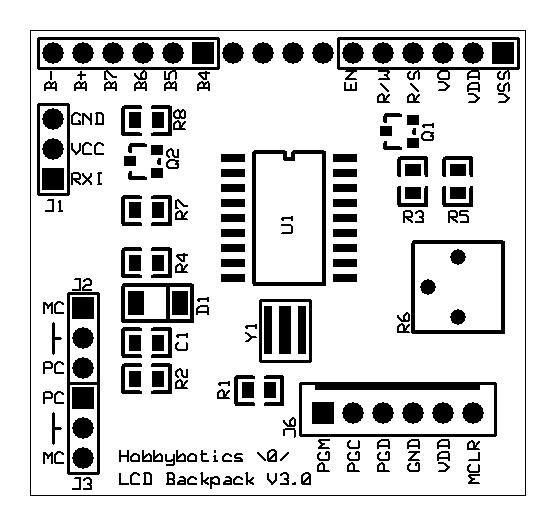 The Hobbybotics Serial LCD controller was designed as an alternative to some of the better-known controllers at a fraction of the cost. The design and feature set is as robust as other well-known controllers such as those available from Parallax Inc and Scott Edwards Electronics. The design presented here is just a prototype. I intend to refine the design and present it in another article. The example code snippets assume that the controller is being interfaced to a Parallax BS2. Reference the documentation for your chosen device to figure out how to send serial data. 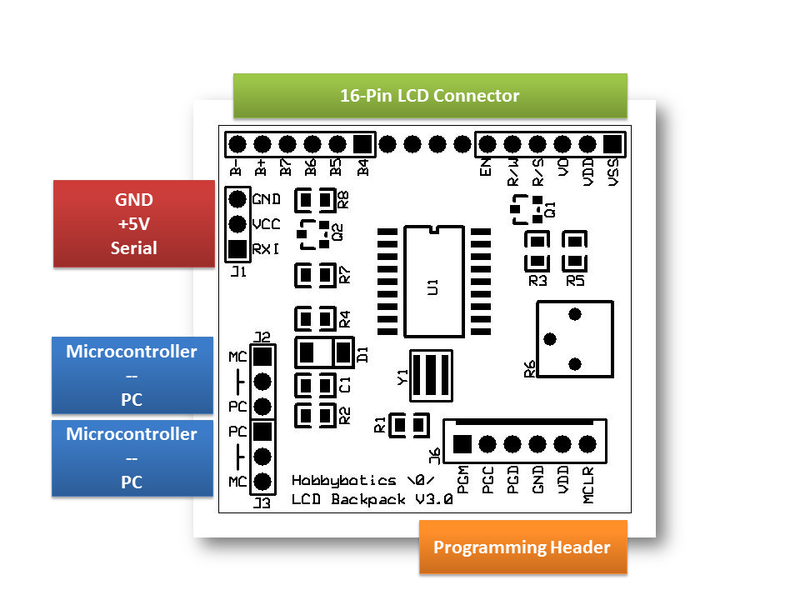 Connecting the Serial LCD Backpack to a microcontroller or PC is straightforward, requiring just three connections, +5V, GND and RX. See figure and tables for typical connections. J1-1 GND Supply GND. Connect to microcontroller GND or DB9-5 of computer. J1-2 VCC Supply (+). Connect to + supply of microcontroller. J2-1 to J2-2 Non-Inverting Jumper if connecting to a microcontroller. J2-3 to J2-2 Inverting Jumper if connecting to RS232 device (such as a serial port on computer). J3-1 to J3-2 Inverting Jumper if connecting to RS232 device (such as a serial port on computer). J2-3 to J2-2 Non-Inverting Jumper if connecting to a microcontroller. The Serial LCD is setup for a default baud rate of 9600 baud. The baud rate can be set to values of 9600, 19200, 38400, 57600 and 115200. This is accomplished by sending the sync byte 254 followed by the commands listed in the table below. The last selected baud rate is saved in EEPROM and recalled on the next power recycle. Ensure the connection to the serial port is refreshed at the new rate to ensure the devices stay in sync. On power up the LCD goes through an initialization routine to allow the applied voltage to stabilize. To allow for proper initialization ensure at least a 100ms delay before data/commands are sent. All commands are preceded by the command byte 254 or $FE*Refer to LCD specifications for pixel mappings. 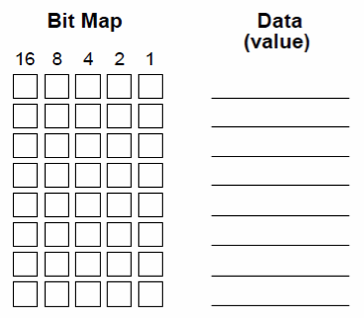 Table 7 lists a typical mapping for a 4×20 character LCD. **Ensure serial connection is refreshed after changing LCD baud rate. To display a character on the LCD, send the ASCII code of that character at the correct baud rate. Once received, the LCD displays the character at the current cursor position and moves the cursor one position to the right. If turned on, the current cursor position will be displayed by an under-carat. When the characters reach the end of the first line the LCD automatically wraps the cursor position to the first character of the next line. There are numerous commands for positioning the cursor on the display. The cursor will automatically advance one space to the right after each character. Extended commands allow the cursor to be advanced left or right one space and positioned at any location on the display. If the cursor position is set in a location where there is existing text, the character will be overwritten starting at the cursor position whenever characters are received. The cursor can be directly placed at any position on the display with the position cursor command. Refer to the below table for an example LCD mapping. A 4×20 character LCD is mapped like two separate 2×16 character LCD’s. As such, once the cursor reaches the end of line 1 (position 19), it will normally wrap to line 3 (position 20). However, the LCD controller corrects this so that the cursor will wrap to line 2 (position 64). Various display modes can be set for the LCD. These include turning the display on/off, turning on/off a blinking block cursor, turning on/off an under-carat cursor, and turning on both the block and under-carat cursors. Turning off the display will not darken the display but will hide any text. Characters can still be sent to the display when it is turned off but will not be visible until the LCD is enabled. The LCD backlight can be turned on/off using a simple command. Refer to the below examples for usage. The LCD backlight is used to illuminate the display. The brightness can be varied from 0 to 100% by passing a value 0 – 255. The current brightness setting can be stored in the controller EEPROM by sending command <12> and recalled by command <13>. The last stored value is also recalled on the next power cycle. Refer to the below examples for usage. The controller is equipped with a 10k potentiometer to control the contrast of the LCD. This may need to be adjusted for optimum viewing. The character generator ram (CGRAM) built into the HD44780 compatible LCD controller allows eight custom characters to be stored into its static ram. These characters are available so long as power is applied to the display. Each byte of CGRAM is mapped to a 5 x 8 row/column of pixels. Custom defined characters correspond to ASCII codes 0 through 7. Writing to CGRAM is accomplished by sending the address location followed by eight byte values that correspond to the created character. Refer to the below figure for an example custom character. The custom character would be stored in the LCD memory using the below formatting. The above example would write the example custom character at memory address 0. This leaves seven memory address locations available for custom characters. Displaying a custom character stored in CGRAM can be accomplished simply by recalling the associated memory location. Reference figure 1 for a typical LCD character set. Add the row and column values for a given character. Figure 1 – To find the ASCII code for a given character, add the row and column numbers. CGRAM custom characters occupy locations 0 -7. The controller circuit consists of a PIC16F628A, a 10K contrast potentiometer, a transistor that allows ON..OFF/PWM of the LCD backlight and a transistor that is used to convert RS232 levels from a PC serial port to 5V TTL levels. 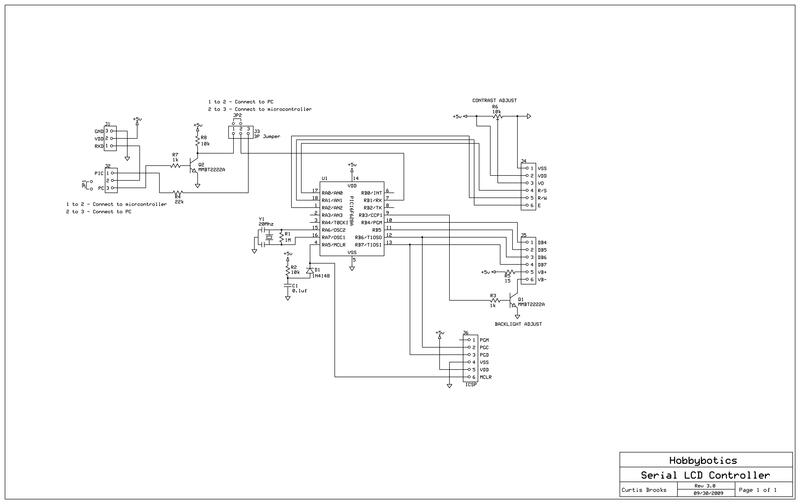 There are two jumpers in the schematic that are used to set whether the LCD will be controlled by a PC serial port or from a serial connection on a microcontroller. JP1 is placed across J2 pins 1..2 if the LCD is controlled by a microcontroller or J2 pins 2..3 if the LCD is connected to a PC serial port. JP2 is placed across J3 pins 1..2 if the LCD is connected to a PC serial port or pins 2..3 if controlled by a microcontroller. Connecting JP2 across J3 pins 2..3 bypasses transistor Q2. This jumper setting is essential for proper controller operation when connected to a microcontroller. 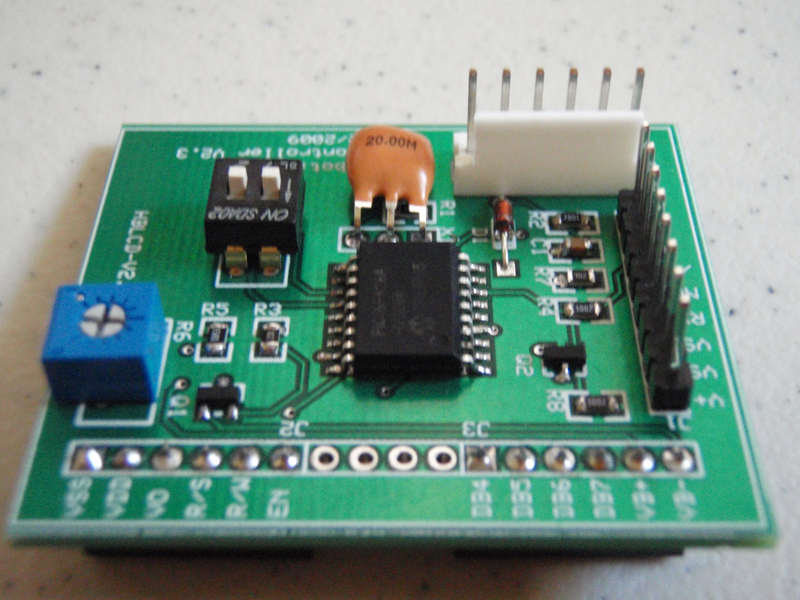 The schematic and PCB was developed with the freely available ExpressPCB software. The project files and future updates can be found on my github page. Reference the B.O.M above for a list of the parts necessary to complete the Hobbybotics Serial LCD Controller V3.0 board. Reference the below layout file for component locations. The firmware for this project was developed using PicBasic Pro V2.60 from microEngineering Labs. You will need to place both *.pbp files into the same directory in order for the code to properly compile. I won’t rehash all of the code here as you can view the complete source for that but, I do want to point out some of the key routines. That wraps up the overview of the firmware so, let’s move along to the optional Windows control application. The windows application I developed for this project allows full control over the LCD functionality. This application was developed with C# 2010. 1 Serial Setup Establishes a serial connection. Automatically detects available ports and saves previously used settings. 2 Text Display Mirrors a 4×20 Character display. Allows text to be sent to each line. 3 Keypad Controls the position of the cursor and allows characters to be deleted. 4 ASCII Characters Sends ASCII characters to the display. 5 Back-light Adjust Turns ON..OFF the back-light and adjusts the brightness. 6 Display Settings Enables..Disables the display and allows the cursor type to be set. 8 Splash Screen Enable..Disable the default LCD start-up splash screen. 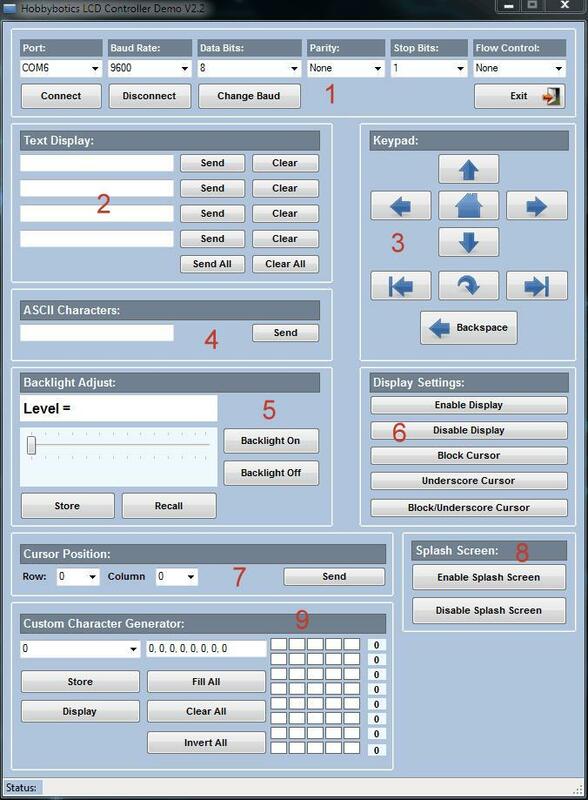 9 Custom Character Generator Create custom up to 8 custom characters and store them in the LCD memory locations 0..7. Custom characters are only stored while power is supplied to the LCD. There is a lot of built in functionality that I have not covered and even though the application is robust, it is still in development. I will post future updates to my github page. 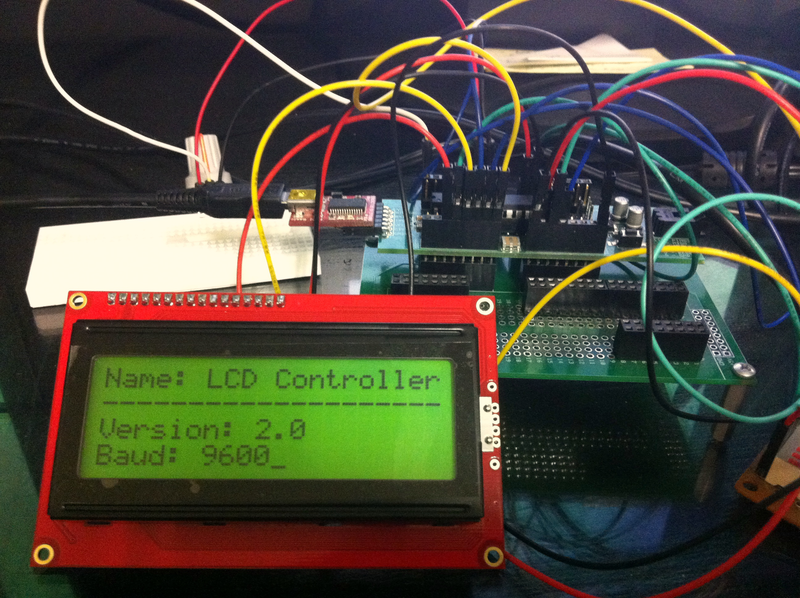 This project covered my design for a serial LCD controller based on a PIC16F628A from Microchip. We began by discussing the features and connections that allow the controller to be interfaced to both a microcontroller and PC serial port. Next, an explanation of the command-set was presented along with typical examples. Finally, we built the project, reviewed key points of the firmware, and presented the optional windows application. Armed with the information presented in this project, one should be able to implement a cost effective serial LCD controller and save some precious I/O pins. This example shows hardware and software used to implement the design. It is recommended the viewer use sound judgment in determining and/or implementing this example for any particular application. This example may include information from 3rd parties and/or information which may require further licensing or otherwise. Additional hardware or software may be required. Hobbybotics or any affiliates does not support or warrant this information for any purpose other than a design example and takes no responsibility for any mishaps (none being implied).